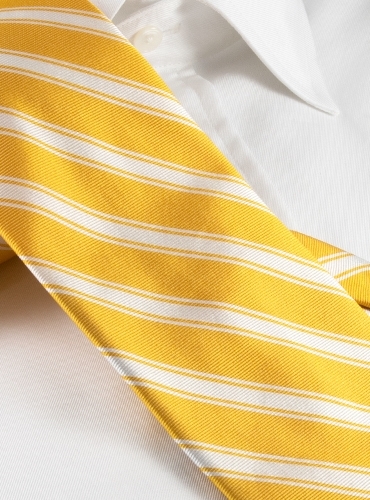 Silk woven double stripe tie, handmade exclusively for us in England. Available in six color options: A-brick; B-sky; C-Persian; D-Kelly; E-jade; F-sun. The name Ben Silver is synonymous with the finest entirely hand made neckwear. Every Ben Silver necktie is cut from the finest materials, usually pure English silk, but often fine wool, cashmere or linen, which is either woven or printed to our specifications. Our ties are hand cut on the bias into 3 pieces, with a hand stitch called a bar tack joining the back. Ties have a “slip stitch” — a single thread holding the tie together and knotted at the bottom — to insure that the tie will return to its original shape when hung in your closet. 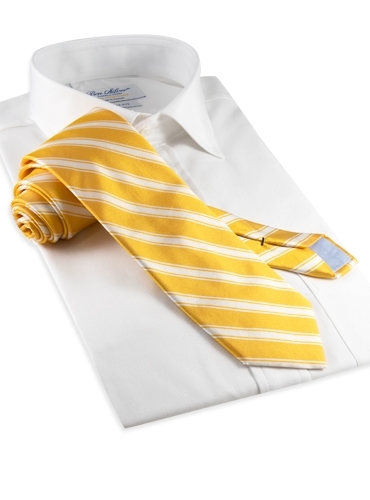 Every tie has a “keeper” sewn into the seams of the blade, to hold the narrow tail end of the tie. Our neckties are wool lined to produce an elegant drape and a perfect four-in-hand knot — one that can be tied with a distinctive dimple. The shape of our ties is proportioned to assure that the blade is balanced against the knot, the collar, the tie space in the collar, and the width of the jacket opening.